If you are interested in a career in a promising professional industry, or you just want to learn more or brush up on your billing and coding skills, then Medical Billing Course Online is for you. Our online courses are specifically designed to help you achieve the results you need to excel in today's medical billing industry. Our online medical billing course will provide you not only with the basics of starting and running your own medical billing business, you will build a solid foundation of advanced knowledge on which you can rely upon from beginning your business through day to day operations that will help you succeed. These courses were written by medical billing and coding experts. Our online courses provide you with instant feedback that will enhance your learning experience. Each course allows you to print a certificate of achievement when you complete a course. We've been working with medical billers for years. We know what it takes for medical billers to succeed in this industry. Once your payment information is verified, you will have immediate access to our courses. 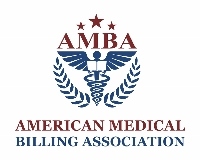 AMBA has a Facebook page where we share a lot of information related to medical billing, coding, compliance, credentialing and specialty specific billing. Currently, we have 16 Facebook Groups, 2 of which exist solely for medical billing company owners to share information and network. See what medical billers say about AMBA on our Facebook page. Copyright © American Medical Billing Association 2019. All Rights Reserved.